Genre: Comedy, slice-of-life, (mildly) romantic drama. Also Recommended: Hidamari Sketch, ToraDora, Minami-Ke. Notes: Based on the manga by Karino Takatsu, published by Square Enix and serialized in Young Gangan. The review lists 13 episodes, but I will also include the special 45 minute OAV "Lord of the Takanashi" in the review, seeing as it's included in the second Bluray volume released in the US. 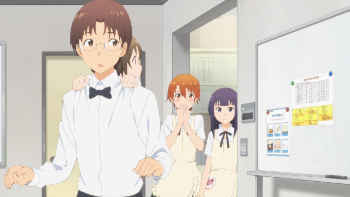 Things have been chaotic in family restaurant Wagnaria, to say the least. Inami has been working on her fear of men, while Sato is still tormented by her love for Todoroki. As for Souta, he seems to be doing fine, but that remains to be seen now that word is his mother might be coming home. Carlos ended up being the one to cover season 2, which is what happens when America gets a streaming release while I had to wait for the DVD/Bluray release. Of course, we see pretty much eye to eye on this show, so my review of said season would sound mostly the same anyway. 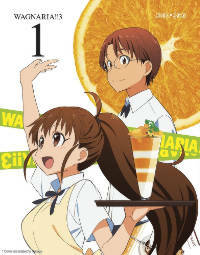 At its root, Wagnaria/Working stood out as a comedy that was funny despite featuring several pet peeves of mine, which served it well in standing out among its many tiresome peers. That was mostly because it heavily deconstructed most of its comedy, particularly the violent parts. That's not to say there wasn't parts that didn't annoy me with the second season, even ones Carlos might not have mentioned. He DID mention that there was some character progression in the show, and I'm not about to disagree with that, but while the characters did indeed progress some individually, the relationship between them remained mostly the same. Baby steps seemed to be a bit of a theme here, but this third (and last) season finally seems to have reached a semblance of a stride. 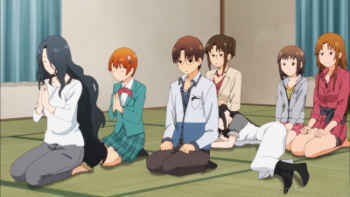 The main thing that fascinates me about the Wagnaria/Working franchise is that it seems willing and able to make people love characters that are hard to love, yet season 3 really aces this conceit. Even early in said season, Souta meets up with the little girl he made everyone think he had kidnapped, and she spends just about his whole workday hanging off his back much to his absolute delight. You'd think the others would start calling him a kidnapper or a creepster, but Popura points out -- and she's right -- that his adoration of the little girl is pretty much harmless, and there's nothing really wrong with it. He really is an oddball when you think about it, but maybe the reason why we find his obsession with the cute unsettling is because it's basically the result of the mental abuse he suffered under his mother's heels, and every time he finds pleasure in something cute, regardless of what it is, we're reminded of that. It's the same with Inami and her fear of men, which as I'm sure you remember from the earlier season, is the result of an almost psychotically overprotective dad. (Whom I'm not ashamed to admit I still really dislike.) Her phobia is the source of what could be consiered the best-animated scenes in the first two seasons; her impressive wind-up punches. But while Inami's phobias are still sort of present, season 3 has her punch men with impressive restraint; a mere two times, so I guess you could say they didn't put her to work punching a (male?) dead horse. In fact, you could even say that both punches landed in the face of two people who really had it coming, one of which even proceeded to prove that point by asking for more. I've always wondered what goes on in her head whenever she's faced with having to deal with men. I don't have any phobias myself -- well, none that I know of, at any rate -- so it's hard to relate to her megaton punches in any meaningful way. But, and I hope you'll forgive me the spoiler, she doesn't punch Souta even once this season. In fact, a lot of her role in Wagnaria! !3 is her coming to terms with her feelings for Souta -- and in turn, his for her -- and she really shines in this season. If you were already a fan of her earlier, you're going to really love her in this season. 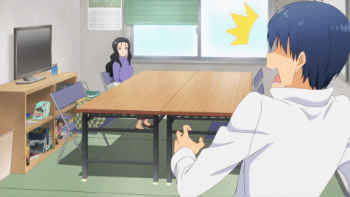 Even Popura put aside her irritating habit of blaming Souta every time Inami looked unhappy, which was one huge pet peeve in the second season Carlos didn't mention. 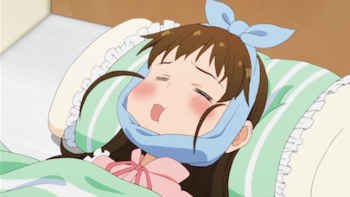 Sure, she's cute as a button, but she had a habit of jumping to some rather odd conclusions while blaming Souta or demanding apologies out of him for no good reason while she was at it -- and while a lot of the comedy in the Wagnaria franchise thrive on misunderstandings, that didn't always make it fun to watch. Yet she might very well be the character in the show that gains the most growth... except in height, which season 3 -- like both seasons before it -- are much too happy to point out. Still, she is arguably the most sensible and duty-driven of the working staff in Wagnaria. Among the others, Sato and Todoroki are still their regular selves. Sato has always been the calmest of the lot, except when he's dealing with his feelings for Todoroki -- and taking out his frustrations on Popura's hair whenever the chance presents itself -- while Todoroki is... well, still carrying around a sword, but otherwise acting normally when not fangirling over Kyoko. So if you're wondering whether the two of them progress on their relationship at all, then I'm going to say "Yes, they do." As for how... well, I wouldn't want to spoil that now, do I? Even Yamada gave me pause for second thoughts. I'd always seen her as this manipulative person who's just playing at feigned ignorance, but that impression got a kick in the knee during the second season where we met her brother, and I had to face the fact that she's just a delusional idiot, with emphasis on the "idiot" part. Mostly because we finally learn why she ran away, and wow, is it a doozy of a misunderstanding. This is also the episode where we get to meet Yamada's mother, who turned out to be a lot more benevolent than we were lead to think. She presents an interesting parallell to Souta's mother, who.... well, didn't rise above her first impression, but rather worsened it. Not because I disagree with her point, at least regarding Souta, but because I find her methods highly questionable (and counterproductive.) Even Yamada's brother, after spending all of the second season being a massive tool, seems to reach some kind of understanding about his role in all of this, and even gets to show off some sympathetic sides of himself. He's still massively clueless, though, and seems to share his sister's alarming inability to read his surroundings when trotting out his complete lack of shame. From an artistic standpoint, Wagnaria!3 looks as good as ever. Granted, we don't really get to see Inami's wonderful wind-up punches anymore -- I think the two times she does punch someone in this one aren't as dynamically directed -- but the show still looks good for the most part. The only mishaps I can think of is when the last episodes have characters looking a bit off when they stand around and talk. Not that they change in a scene itself, but every time the camera cuts, we will be shown a somewhat cheaper-looking rendition of any of the characters in the show. That said, the show looks pretty good on average, and the intro and ending themes, despite me never getting to be a huge fan of the songs, are fun, energetic and generally excellent. 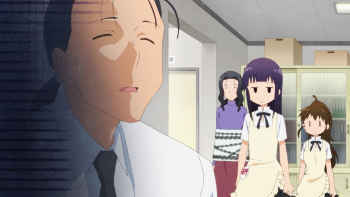 I haven't really had the pleasure of watching the new Wagnaria/Working series, now that there is one. This season, while not entirely ending their respective stories, concludes at a pretty good stopping point. This is infinitely more worth when you consider that anime in general has a bit of a problem reaching any kind of conclusion, though part of that is because a lot of popular manga today are still running, so I'm not entirely blaming anime for this. But the fact that Wagnaria actually ends here with a bit more finality than you'd normally see makes it even more rewarding. Technically, the TV series isn't what provides the ending, but since the special OAV is included in the second Bluray set -- it was never released on DVD for some odd reason -- I'm including it in this review. It might be the best selling point the show could've had, since the Bluray set is a bit pricey compared to your average Sentai or Funimation set, though probably not as brutally so as earlier Aniplex releases. Recommended Audience: There is some mild fanservice and also some slapstick violence, both real and implied. But the part that makes this show a bit unsuitable as children's entertainment is the mature way it handles itself and its characters many issues. There isn't anything in this show that can harm children; they mostly just wouldn't understand what is going on and probably find the show boring. Both teenagers and adults would, however, and the show is perfect for both of them. Version(s) Viewed: Region A Bluray, sub only. Wagnaria! !3 © 2015 A-1 Pictures, Aniplex.